The weekend means pizza, right? Yup. That deliciously greasy, cheesy, caloric pizza. But wait! I have an alternative for you! 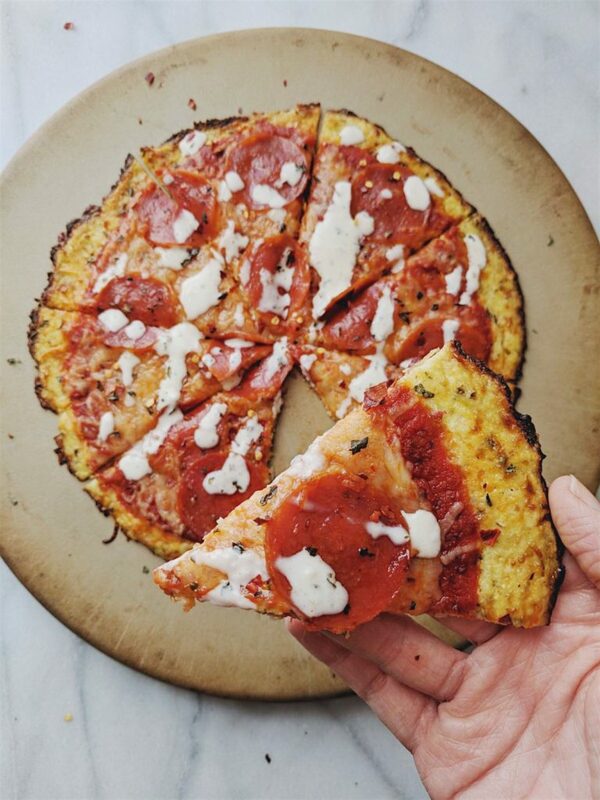 This Easy Cauliflower Crust Pizza with Homemade Ranch is a vegetable. 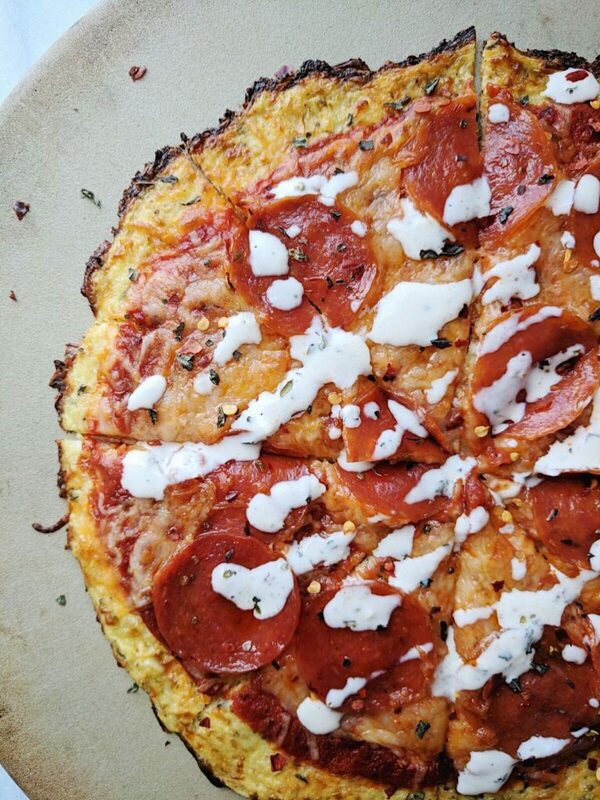 Yes, there is an ENTIRE cauliflower in this pizza. You’re welcome. I’ve been wanting to hop on this trendy cauliflower train for a long time now. But 1) I didn’t have a food processor and 2) I’m too cheap to buy cauliflower rice or the frozen pizza crusts in the store. Now, I’m not saying this pizza is completely “healthy”…there is still cheese. And pepperoni. Because what would pizza be without those delicious toppings?! That’s where the balance comes in, my friends! Speaking of balance, isn’t pizza the best thing ever? Ben and I use Saturday as our day to eat whatever we want. So, usually….we wake up. And I have eggs. Ben has cereal. For lunch, sometimes it’s boxed mac and cheese. All the while we are snacking like crazy. And then for dinner…dun dun dun!!! PIZZA! We always get delivery pizza and I make homemade ranch and it’s truly the best thing in the world. But…let me just go ahead and just get it out there by saying: this doesn’t taste EXACTLY like a pizza. 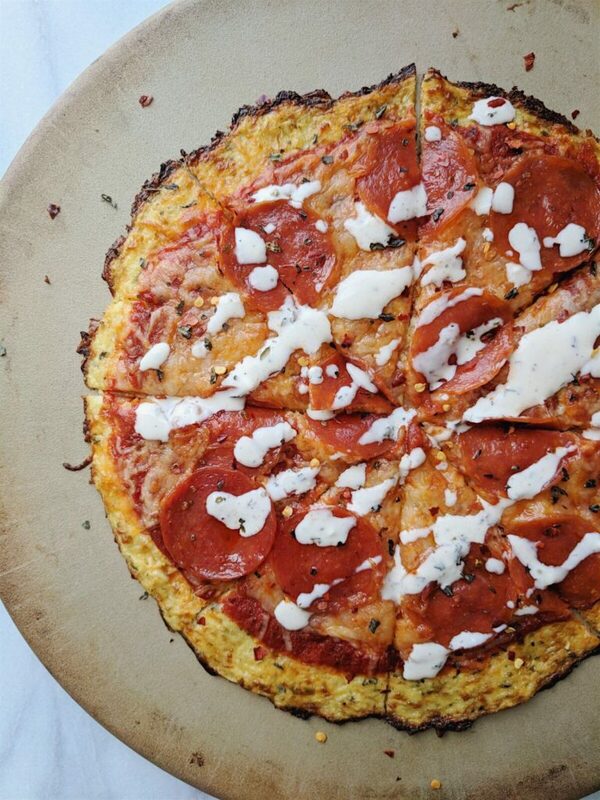 But how can you make an entire cauliflower your crust and expect it to taste like Dominos? I will say the cauliflower taste is not nearly as overwhelming as I thought it would be. It’s very subtle and the pizza toppings work extremely well with the flavors. ALSO! The crust held up SUPER WELL. I thought I was going to have to test this recipe about a hundred times to get the crust to not be soggy but no way! I was able to hold the pizza slice like a normal piece of pizza and the toppings didn’t fall off! See photo below for evidence. I usually love to load up my pizza with tons of veggies – but sadly, I only had pepperoni in my fridge! I would suggest putting some red onion or green bell pepper on it for that Supreme pizza vibe. Overall, the flavor of this pizza was amazing! It was an awesome “healthier” substitute that I was able to enjoy without feeling like I was missing out on the real thing. Oh and of course….I had to pair it with dat good good homemade ranch dressing. I swear, us southerners will eat ranch dressing on anything. I remember dipping my dinner rolls into ranch dressing when I was a child….mmm, I’d still probably do that now. Anyway! Make this pizza this weekend just to see whatcha think. I promise it will pair well with your favorite Netflix show and a cozy blanket. Find the recipe below! Happy weekend, friends. 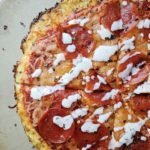 Easy Cauliflower Crust Pizza with Homemade Ranch! Preheat oven to 425. Chop your head of cauliflower into florets. Place them into a food processor. Pulse a few times until you get a rice/snow texture. Microwave this for 4-5 minutes, or until soft. Let this cool. Spread your cauliflower mixture onto a thin, clean dish towel. Twist it up and wring it out! Seriously, press, squeeze, twist until you get all of the excess moisture out! Transfer to a bowl. Add 3/4 cup of cheese, 2 cloves minced garlic, egg, salt, basil and oregano. Combine well. Place parchment paper or silicon sheet onto a baking sheet. Move the dough onto the baking sheet. Flatten into the shape you want your pizza to be in. I flattened mine until it was very thin, which provided a crispier crust. Mix your mayonnaise and milk together until it forms the consistency you like. If you need it thinner, add more milk. If you like it thicker, add a bit more mayonnaise. Add any spices you want until it tastes yummy! I added salt, pepper, oregano, basil, thyme and cayenne. This recipe is extremely customizable. You just have to get the base right with the mayo/milk recipe!